Children love to smile and parents love to see their children smile. Unfortunately, at this time of year, for some families, smiles are difficult to find. Every year, thousands of children and their families spend time in Canadian hospitals over the holidays. And while they may have difficulty finding their smiles, I do believe that there is always a smile hiding in there, and we have to find creative ways to bring that out during particularly difficult times. For children who are sick, we have to get creative and Duracell has done just that! All children love to play and Duracell is helping children who are in the hospital do just that by powering up their imagination! Duracell believes in powering the imagination of sick children by helping to ensure kids can still be kids, and enjoy the magic of the season even in the midst of illness. For the 10th year in a row Duracell will be donating a year supply of batteries to hospital playrooms across the country to power smiles this holiday season and beyond. You can get involved in powering smiles and imagination too. Duracell will donate to Children’s Miracle Network. The goal this year is to raise $150,000. To find out more on how you too can support Children’s Miracle Network hospitals to power imagination of kids throughout the holidays please visit Duracell.com/cmn. By providing children with toys that encourage their imagination, they are able to escape the reality of the moment (or their situation), which can be a benefit both mentally, physically and emotionally. 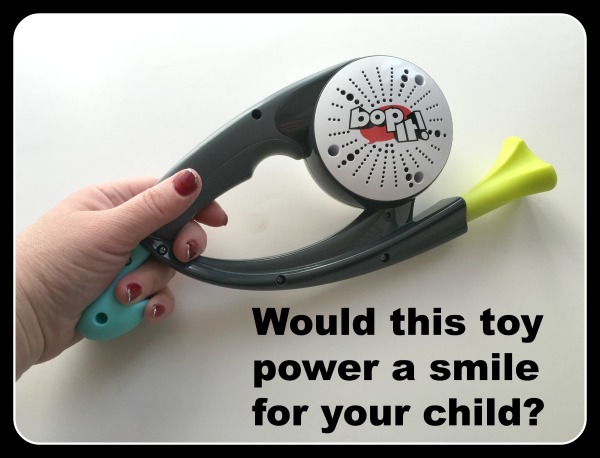 An example of a toy that uses your mind, but does not put too much physical strain on a child’s body is The Bop It! Game by Hasbro. I will admit that these types of games can be loud, but the great news is that this particular game has 3 sound levels! This is a motion based game that includes ten moves including: whip it, drink it, selfie it, hammer it, answer it, cradle it, saw it, sing it, golf it, and comb it. This game is portable and can be played individuall or in group mode for fun together as a family. Every child deserves to enjoy the magic of the holiday season! Powering smiles is an essential part of childhood! What toy does your child enjoy the most that makes them smile? Tagged activities for kids, children's miracle network, games, kids, kids hospital. Bookmark the permalink.